NYCC 2018: When earthlings become Martians — National Geographic's 'Mars,' season 2 – AiPT! The hybrid documentary/drama returns November 12. On a 79 °F October 4 at New York Comic Con, the cast and crew of experimental National Geographic Channel program Mars gathered to tease the assembled crowd about what they might see in season 2, set to begin on November 12. “Season 2 starts with a new colony that arrives with a different directive,” said new showrunner Dee Johnson, describing a group looking to simply exploit the red planet for its resources, whatever the consequences, in contrast to the scientific colony already working and living there. Moderator and Discover magazine editor Corey Powell asked what it meant to be a good leader in such a harsh place, prompting Jihae, who portrays original mission commander Hana Seung, to remark that “a great leader is in the service of the people.” Jeff Hephner, AKA industrial mission commander Kurt Herrelle, said he is also in service of the people — his people. “These two leaders have to find a way to make it work together,” Hephner said. But why bother? What’s so great about going to Mars in the first place? “Earth is going to get hit by another large asteroid,” said Stephen Petranek, author of the book How We’ll Live on Mars, which the Mars TV series is based on. It’s almost inevitable. Futurist and pop media maven Michio Kaku took it a step further. “It’s practically a law of physics that Earth will be destroyed,” Kaku said. “Extinction is the norm,” he continued, pointing out that 99.9% of the fossils under everyone’s feet are of animals that don’t exist anymore. We need a “new branch of human life” to continue when this one dies off, and Kaku is glad that private industry is pushing us toward that again, speaking of how competition has driven costs down so far that India’s first mission to Mars only cost $74 million, versus the $108 million needed to film The Martian. 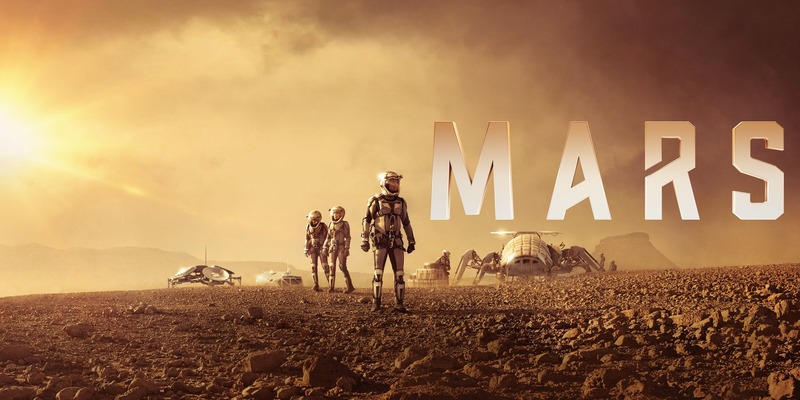 “It cost more to make a Hollywood movie to Mars than it did to go to Mars,” Kaku said. “NASA said they could go by the mid-2030s,” said Andy Weir, author of The Martian himself. But they just don’t have the budget. Weir thinks that if government will get the first people to Mars, it will have to be a coalition of countries with a common goal. Petranek vehemently disagreed. “If you think NASA’s going to do it, you’re in fairy land,” he said. Or maybe a land of former life, as astronomer Lucianne Walkowicz thinks. “There were literally oceans on the surface,” she said of the strong possibility, with Kaku saying there might still be life on Mars, underground or at the poles. “Not to be a Debbie Downer,” but Mars probably never had life, Weir objected. Life is literally everywhere on Earth, so the fact that samples we’ve looked at on Mars have nothing at all is not promising. And even if it is there, it doesn’t need “planetary protection” from us — it’ll be much heartier than we are. It’s not just biology on Mars; season 2 will also look at the concepts of psychology and justice. Executive producer Justin Wilkes said we’ll see a colony vs. empire aspect, and we’ll remember that the people who volunteer to explore with only a small group are gifted with great mental fortitude. Evan Hall, who plays a member of the industrial crew, said you’ll see how those people deal with each other, and it won’t always be diplomatically. Hephner talked about “preserving ourselves” rather than preserving Mars, and while Johnson understood that instinct, she sympathized more with those who don’t want to rush in. Mars is a television series that mixes both drama and documentary elements. Season 2 begins on National Geographic on Monday, November 12, at 9:00 pm eastern time.